Canada is well known for its vast natural resources and mining industry, which makes it an important country for international investors to consider. While the country has a number of different stock exchanges, the most popular is the Toronto Stock Exchange ("TSX") - one of the largest stock exchange in North America by listings and eighth largest in the world by market capitalization. Given Canada's extensive natural resources, the TSX houses more mining and energy companies than any other exchange in the world. These securities consist of not only common stock but also exchange-traded funds ("ETFs"), income trusts, split share corporations and investment funds, which provide international investors with many different investment options. The exchange is open from 9:30 am until 4:00 pm Eastern Time, with a post-market session from 4:15 pm until 5:00 pm Eastern Time on all days of the week except Saturdays, Sundays and holidays declared by the exchange in advance. These trading hours put it on par with U.S. stock exchanges like the NASDAQ and New York Stock Exchange (NYSE). In this article, we will take a deeper look at the Toronto Stock Exchange, how U.S.-based investors can invest on the exchange and some of the most popular companies listed on the exchange. The Toronto Stock Exchange consisted of over 1,500 companies, as of 2017, worth a total of $1.77 trillion in market capitalization. While the majority of these companies are based in Ontario (52%), a substantial portion of the exchange's market capitalization also comes from Alberta (25%), due to the region's rich natural resources - namely, oil and gas in the oil sands. The exchange's breakdown of sectors by market capitalization shows a skew towards financial services (38%), energy (20%) and materials (10%), while industrials and consumer discretionary round out the top five sectors. Many of these companies consist of so-called junior mining companies focused on developing natural resources, such as gold mines or timber yards. Listing requirements on the Toronto Stock Exchange vary based on the type of company seeking a listing. For instance, mining companies must meet certain property, work program, and working capital requirements before listing, while oil and gas companies have only working capital and financial requirements that must be met to qualify for the exchange. Smaller companies that don't qualify for the TSX exchange may instead be listed on the TSX Venture Exchange, which is similar to the OTC Markets or NASDAQ OTCBB in the United States. These companies have less of a track record and may be in development stages compared to the larger companies that are listed on the larger TSX exchange. Canadian stock markets are very accessible to U.S. markets, especially when compared to many other exchanges around the world. While direct investment on the Toronto Stock Exchange is relatively easy to accomplish, many companies also dual list on U.S. stock exchanges, making it even easier to invest in the same companies on domestic exchanges. Investing in TSX-listed companies can be accomplished through most online brokerage accounts, such as TD Ameritrade or E-Trade. Commissions may be more than domestic trades but remain reasonable compared to many traditional stockbrokers. However, investors should be sure to consult their accountants or investment professionals to learn of any tax implications. 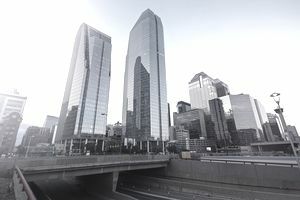 Those looking to invest in Canadian companies trading on U.S. stock exchanges can look into American Depository Receipts ("ADRs") that are available for many larger companies. These securities trade like traditional stocks, mimicking the price movements of the foreign listed shares, but tend to be slightly less liquid at times than their TSX-listed counterparts. The Toronto Stock Exchange attracts many of the world's largest natural resources companies, making it a popular destination for international investors. Investors can find many of the most popular companies listed on the exchange by looking at the S&P/TSX 60 Index, which consists of the 60 largest companies listed on the exchange by market capitalization. Investors can also consider purchasing the iShares S&P/TSX 60 Index Fund (XIU) that trades on the Toronto Stock Exchange or one of many Canadian ETFs trading on U.S. exchanges. The Toronto Stock Exchange - or TSX - is one of the largest stock exchange in the world. With Canada housing extensive natural resources, the TSX is the single most important exchange for natural resource focused companies engaged in energy or other commodity markets. U.S. investors can gain exposure to the market through direct trading or ADRs, with many of the largest natural resource companies listed in the world on the exchange, including names like Barrick Gold Corp. (ABX).